It continues to amaze me that I get asked to publicize events, attend media promotions--or really to do anything that relies on the assumption that because I have chosen to publish my thoughts about food on the internet, that people out there for some reason: a) read, b) care about, or even harder to believe, c) act upon what ends up on my blog. But I like to imagine that in the publicity business they still say, “There is no such thing as bad publicity,” in which case I suppose I can understand. And every once in a while (for the good or bad of the event I don't know), something comes along that I feel compelled to share. June 8, Denver’s own soul food scholar, Adrian Miller, will be giving a talk called, “Black Chefs of the White House,” as a fundraiser for the Campbell Chapel African Methodist Episcopal Church's health and wellness ministry and the Colorado Black Health Collaborative at the Turnhalle Ballroom at the Tivoli Student Union. And there won't just be talking about food, your ticket includes a meal that represents food made by the many black chefs in the white house all the way from George Washington to our current chef to the chief. If you have read this much blog before then you know that what I love most about the country that we live in is the blurring of cultures, traditions and authenticity. 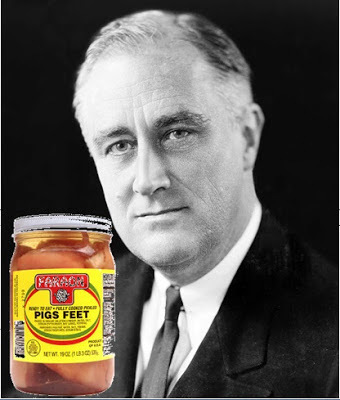 Learning that African Americans have been omnipresent in the White house kitchen staff does not surprise me, but to imagine the day FDR fell in love with pig's feet, or that LBJ used the experiences of his African American cook to lobby for the 1964 civil rights act is certainly something I want to hear more about. So if your curiosity is piqued, too, check out the event details. I do a, b, and c, and I'm the better for it! Thanks for tuning in, Elias!